Ancient astrologers viewed eclipses negatively, believing that they upset the order of things. However, modern astrologers believe that a solar or lunar eclipse brings about certain energy. They believe that the eclipses can reinforce the direction in which a person is headed by focusing on certain areas where change is needed. It is believed that the eclipses bring about quick changes for the cardinal signs (Aries, Cancer, Libra, and Capricorn). The fixed signs of Taurus, Leo, Scorpio, and Aquarius will see less abrupt changes, but may notice them in the long term. Mutable signs (Gemini, Virgo, Sagittarius, and Pisces) will be more open to change in their daily routines, but also long-term events. A solar eclipse occurs when the Earth’s moon passes between the Sun and Earth during a new moon phase. During a solar eclipse, the sun is either partially or totally hidden from view. There are between two and five solar eclipses each year, with no more than two total eclipses in a single year. Solar energy is seen as being external, paternal, protective and active. Astrologers believe that the energy the solar eclipse brings will produce external changes. A lunar eclipse occurs when the Earth’s moon passes through some part of the Earth’s shadow during a full moon phase. For a lunar eclipse to happen, the Sun, Earth, and Moon must be aligned exactly or very closely, with the Earth being in the middle. During a lunar eclipse, the Sun and Moon are in opposite astrological signs. Lunar energy can affect us in many ways. It is internal, maternal, nurturing, and emotional. 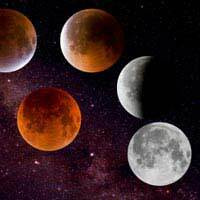 Astrologers believe that the energy the lunar eclipse brings will produce internal or emotional changes. Where the eclipse falls on your birth chart, it tells you in which areas you need to make changes. For example, if the eclipse degree falls in your First House, you will want to take a close look at your appearance or health. You may need to focus on your health or make changes to your wardrobe. When the eclipse degree falls in your Second House, it signifies changes in income or employment. It may be a good time to look for a new job or gain new career skills. The eclipse degree in the Third House relates to communication, siblings, and your environment. You may have to make changes in your relationships with your siblings or neighbours, or may need to change your route to work. If the eclipse degree falls in the Fourth House, you will need to focus on your home life and family. Maybe you need to spend more time with your spouse or look for a new house. The eclipse degree in the Fifth House means you need to focus on children, creativity, and romance. Express yourself creatively through a new hobby or spend more time with your children. When the eclipse degree falls in your Sixth House, it signifies changes in the area of work and health. Focus on how you can be more efficient at work or set up a program to help improve your health. If the eclipse degree falls in the Seventh House, you will need to focus on your marriage and partnerships. This may be a good time to start or end a relationship. The eclipse degree in the Eighth House means you need to focus on joint resources, sexuality, and secrets. This focus can include your possessions as well as those of your partners. The eclipse degree in the Ninth House means you need to focus on travel, religion, and education. You may want to continue your education or seek out new spiritual practices. This is a great time to try something fresh and adventurous. When the eclipse degree falls in your Tenth House, it concerns your career, status, and public reputation. Work on your relationships with those in authority and you may find yourself getting public recognition for something. If the eclipse degree falls in the Eleventh House, it concerns your friends, groups and humanitarian goals. You may lose or gain friends from your inner circle. When the eclipse degree falls in your Twelfth House, it signifies changes in your spirituality, dreams, and retreat. Pay more attention to your dreams to try and understand what they are telling you. Solar and lunar eclipses are exciting events that can also be used as astrological tools to help you focus on the future.